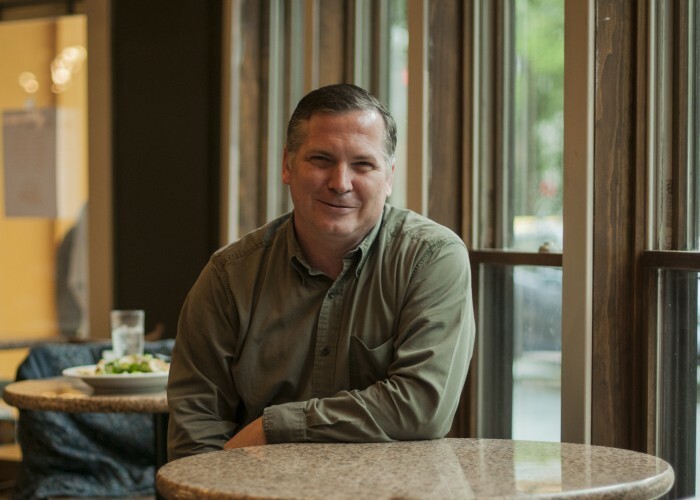 After a lifetime in the restaurant industry and more than two decades in Calgary, Chard Ares was brought on board to start a new venture with old friend and former New York restauranteur-chef Keith Luce. At the time, Chard wanted to open a combination market-restaurant that offered a sit-down dining experience, as well as an Italian market with premium imported groceries and ready-made eats and Keith had a similar vision for a venture of his own. So instead of competing with one another, Chard and Keith joined forces to open Parm. Enlisting the help of Calgary chef Barrie Flett for the kitchen and Dean Petrillo (former owner of Dino Rosa’s Italian Market) for the market, Chard and Keith opened Parm at the beginning of May 2017. The exterior of the building was updated with a coat of sunny orange-yellow paint and Parm finally opened its doors to the public. “We took some of the colours and really brought the street to life,” Chard says. The restaurant’s interior combines a traditional Italian dining atmosphere (and classic checkered table cloths) with a modern and spacious layout, painted red walls, modern lighting and massive front windows that provide ample natural lighting. Parm’s market and grab-and-go counter is located at the restaurant's entrance with imported Italian groceries as well as Parm’s own ready-to-eat and ready-to-make specialities. Breakfast options such as pizettas and lighter morning fare are also available starting at 7 a.m. on weekdays. Located just a short few steps above the market, the dining area has both an upper and lower level that are all centred around the restaurant’s open concept pizza station and forno wood fired oven. 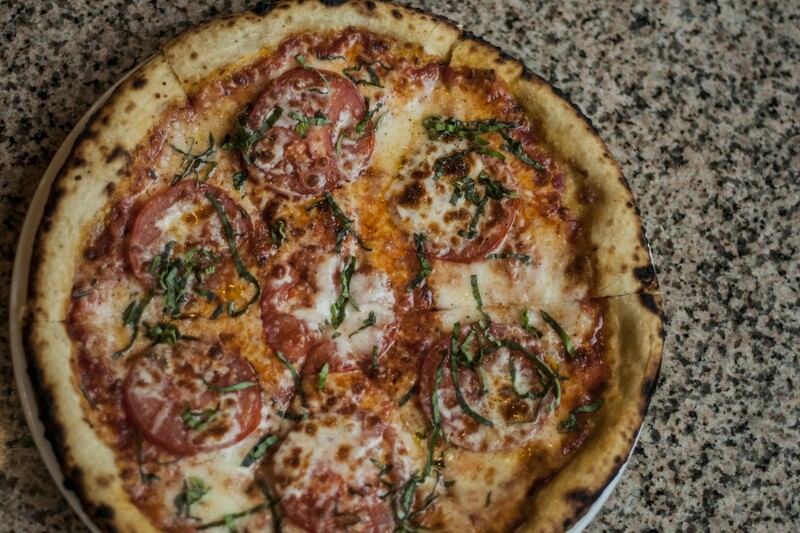 “What we’re focusing on is the wood fired pizza. It’s the centre and it’s the heart of Parm,” Chard explains. Stoked by Okanagan Applewood (which is brought in on a weekly basis), the oven often reaches temperatures that exceed 1,000 degrees. It is designed to retain and radiate extreme heat, which results in a quick and evenly cooked crispy Neapolitan-style pizza pie. 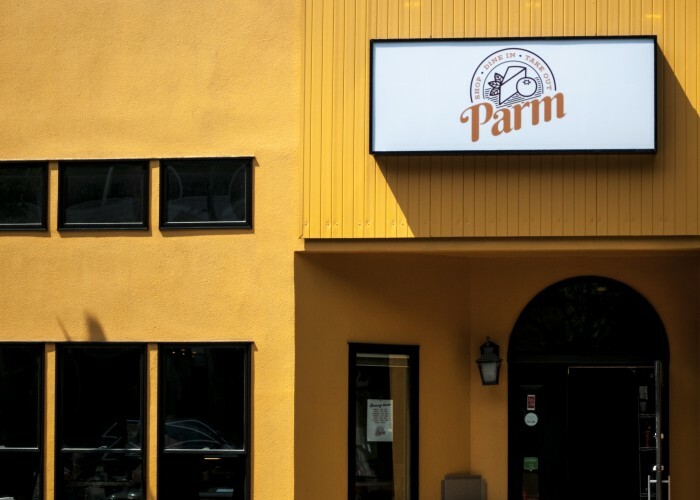 Much of Parm’s food philosophy derives from the experience of chef Barrie, who has always had both a passion and penchant for quality Italian cooking. In many ways, Parm’s menu is an extension of Barrie and his own personal philosophies about food. The menu is simple in preparation, but everything is made in-house and there’s a story behind every dish that comes out of the kitchen. The Caesar salad, for instance, is a Flett family recipe with a top secret dressing that not even Barrie has been privy to. He’s spent years trying to replicate the dressing and has finally perfected his final iteration. The salad is coated in a light dose of Barrie’s dressing and arrives topped with charred lemons, house-made croutons, bacon and a healthy sprinkling of cheese. 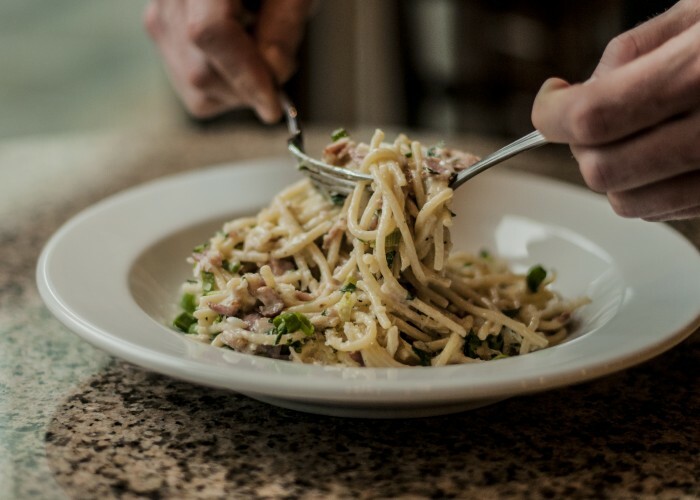 Another popular offering (and one of Chard’s own personal favourite dishes), the spaghetti carbonara, is a comfort food staple. Topped with bacon, green onion and Grana Padano, the spaghetti is coated in a rib-sticking cream sauce with olive oil, egg and white truffle oil. "We want to make sure [our food is] looked after and cared and loved," Chard says. "We really want to have the best quality ingredients that we can, and it shows."